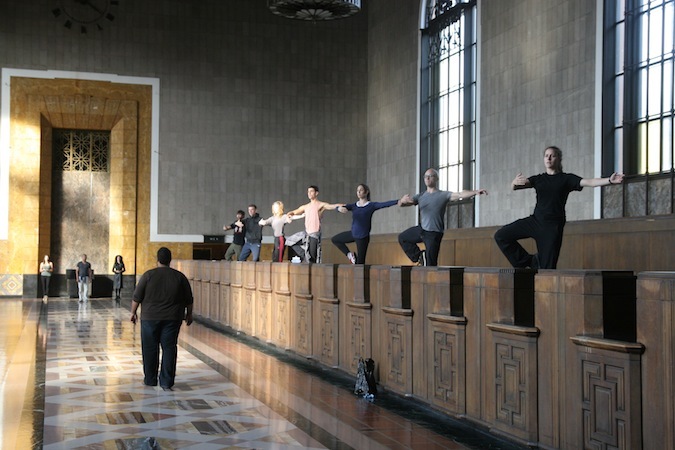 The cast of “Invisible Cities” rehearses at Union Station. Photo courtesy of The Industry. A tall, slim dancer commands the attention of everyone in his immediate area in the entrance of downtown LA’s Union Station. He’s rehearsing for Invisible Cities, an experimental opera collaboration between Yuval Sharon’s The Industry and Benjamin Millepied’s L.A. Dance Project, which premieres Saturday at the stroke of 7 pm. Falling, sliding, lunging and flailing, the dancer executes large movements in a designated small space. Suddenly, another dancer gallops briskly by the first company member, hands flapping wildly, scratching his head and neck, keeping to his own rhythm. But he doesn’t stop. He heads out the main doors and into the night because, in fact, he is not a cast member. 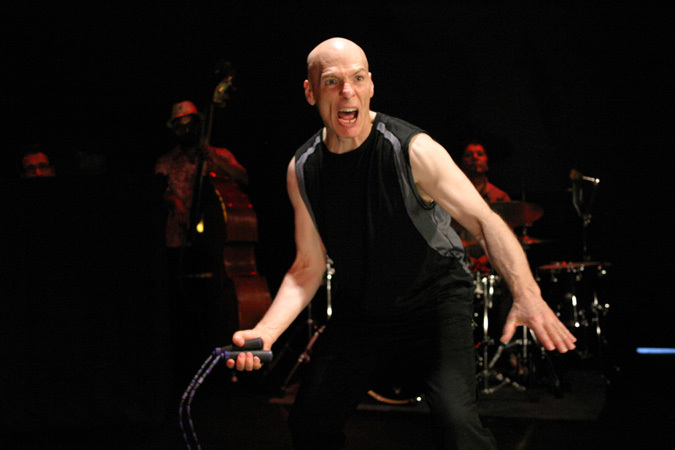 In retrospect, he was one of the eccentrics who frequent Union Station, one of the many characters who will make this innovative production even more interesting and challenging. Jonny Rodgers, Dylan Kenin and Erica Rice in “Miss Julie(n).” Photo by Ashley West Leonard. When Ken Roht first saw Mike Figgis’ 1999 film Miss Julie, an idea was born. As a gay man, Roht (best known for his 99cent holiday shows) thought he could completely relate to Julie. He knew at once he wanted to embody her on stage. Ten years later, although Roht has handed the title role to Jonny Rodgers, Ken Roht’s Miss Julie(n) opens at MorYork Gallery this week for 12 performances through March 10. More than a few artists have shared Roht’s impulse to recreate Miss Julie. August Strindberg’s 1888 play popped up in 1971 on television with Helen Mirren, again as the Figgis film starring Saffron Burrows, and in 2007 at LA’s Fountain Theatre, this time set in 1964 Mississippi with an interracial twist. One month from now the Geffen Playhouse presents Neil LaBute’s adaptation directed by Jo Bonney, and it was recently reported that Liv Ullmann will direct a new film version starring Jessica Chastain and Colin Farrell. The Living Word Project’s red, black & GREEN: a blues begins with an invitation to audience members to tour the stage as if they’re in an art gallery. During their walking “tours,” theatergoers can examine four structures representing cities — Chicago, Houston, New York, and Oakland. In each of these cities, Living Word Project’s artistic director Marc Bamuthi Joseph has produced one of his Life Is Living urban eco-festivals. Together, these cabins on the stage, crafted by artist Theaster Gates, form a shotgun house. Joseph describes it as similar to a shack in a township in Soweto, Johannesburg, or on a back road in Fifth Ward Houston. An actor occupies each of the structures. “The actors are basically performing aspects of the show that will make a little deeper sense later,” says Joseph, referring to the rest of his 90-minute meditation on what sustains life in struggling communities. “The whole first half-hour is a gallery installation that’s a foreshadowing of the linear play to come.” It all starts Thursday at REDCAT. Mikhail Baryshnikov is standing alone on stage. A woman walks toward him. Not a prima ballerina, but a young Moscow-born actress named Anna Sinyakina, or “a mysterious creature,” as Baryshnikov calls her. He doesn’t lift her over his head. She doesn’t spin swiftly between his fingers. Their bodies are still. He speaks Russian for the first time on stage. 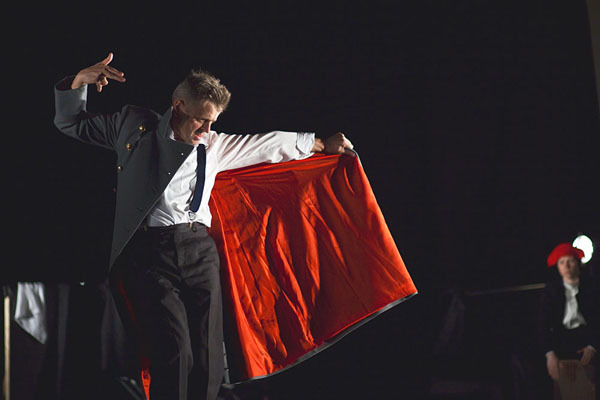 This is not the image most people have of Baryshnikov performing. He is now 64, about two decades past the period that he considers the peak of his ballet career. This week, Baryshnikov kicks off the U.S. premiere of In Paris, an adaptation of a short story by Ivan Bunin, the first Russian to win a Nobel Prize for Literature in 1933, at Broad Stage in Santa Monica. Bunin lived in exile in France after the Russian Civil War (1918-1920) and died in Paris in 1953, never having returned to Russia. Bunin’s background informs In Paris. “It’s a very simple story about a White Army general who lives in Paris and meets a young woman, also Russian, and they have a certain tragic love affair,” Baryshnikov says via phone from his Baryshnikov Arts Center offices in Manhattan. He speaks in a matter-of-fact tone, which he maintains throughout our conversation two weeks before the Los Angeles opening. 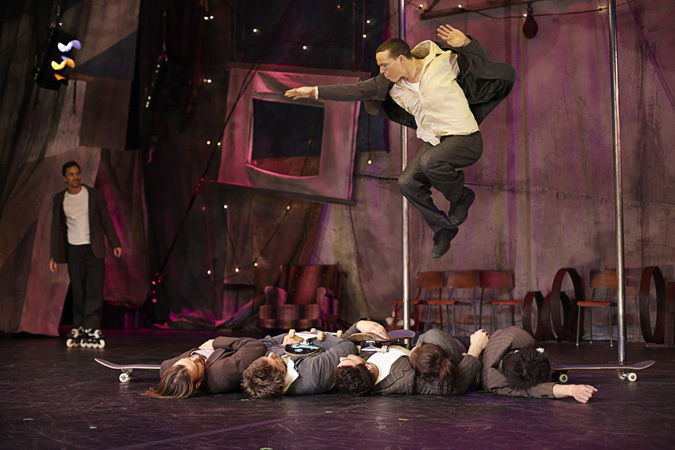 The premiere of In Paris took place in Helsinki in August 2011. 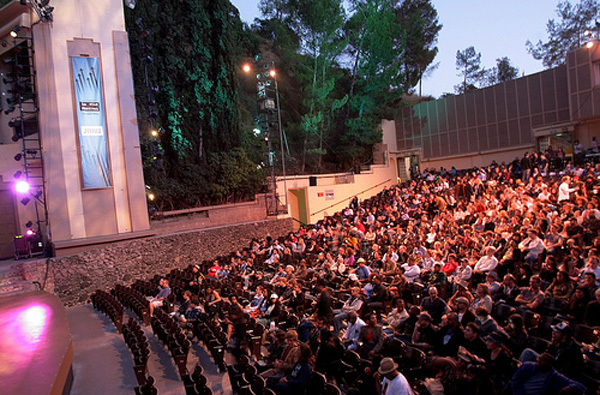 The show then traveled to the Netherlands, Paris and Tel Aviv, and it’s scheduled to continue on to Berkeley, Italy and New York. The script is in French and Russian, with English supertitles.